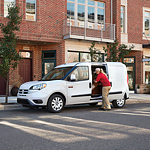 Are you thinking of purchasing the Ram ProMaster City? If so, at Lithia Chrysler Dodge Jeep Ram FIAT of Eureka our team thinks that it is an outstanding cargo van/passenger wagon. The van comes with a number of features that enhance capability and efficiency. With the ProMaster City, a 2.4L Tigershark Multiair 2 engine and class-exclusive nine-speed automatic transmission is included. The engine comes with best-in-class horsepower, torque, and highway driving range. The engine can reach 178 horsepower, 174 lb.-ft. of torque, and has a highway driving range of 448 miles. In addition, the engine is also equipped with a three-piece air filer and a pulse-width-modulated fuel pump for exceptional efficiency. The ProMaster City also comes with a class-exclusive bi-link rear coil suspension system. This provides drives with a smooth ride and superior handling. With the bi-link rear coil suspension, Electronic Stability Control is also included that compensates for oversteering and understeering by activating the brakes to keep the van moving in the right direction.